Use the Template Editor to add formula fields to your template. item_id is used to get a unique item number. This can be used as an auto-increment identifier. 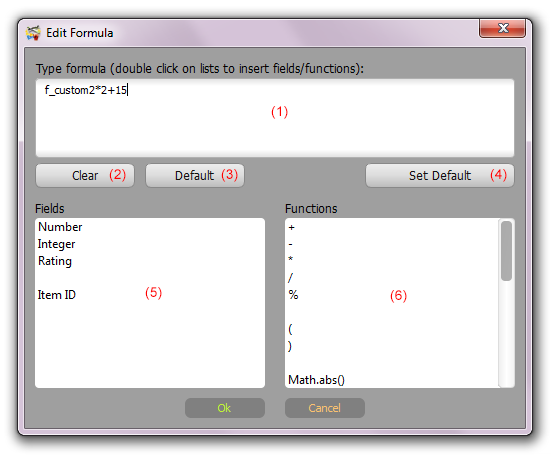 Formula Editor contains a Fields (5) and Functions (6) list with available database fields and the most popular functions. Double-click item in the list to auto-insert it to the formula. The customer can set a personal formula, or use a default formula. If you leave blank a formula field (1) for your item, Multi Collector will use the default formula. 'Clear' (2) - Clear the field formula (use default formula). 'Default' (3) - Show the default formula for this field. 'Set Default' (4) - Set current formula as a default for all items.